Mother nature may have erased five runs off the Pitt baseball team’s stat sheet, but she arrived too late to wipe out the Panthers’ win. Pitt (25-19 overall, 10-13 ACC) returned home after a successful weekend at Notre Dame with a rain-shortened 5-3 victory over the Youngstown State Penguins (11-32 overall) at Charles L. Cost Field on Tuesday night. Junior Nick Yarnall got things going early for the Panthers with a two-run home run in the bottom of the first, his team-leading 10th homer of the season. 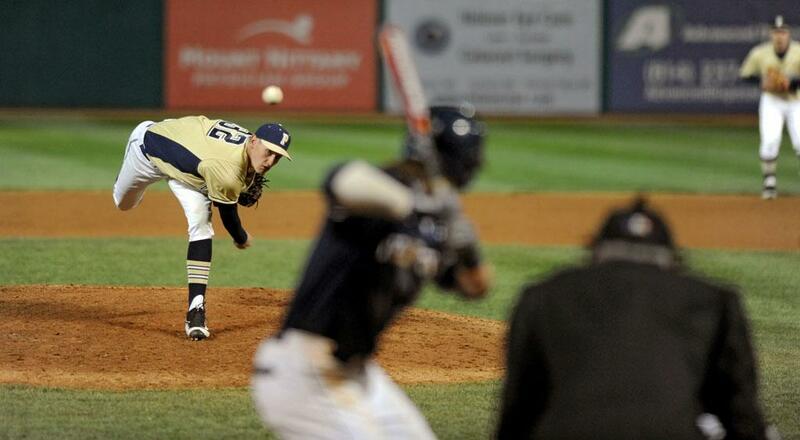 First-year right-hander Collin Liberatore (3-1) got the start for Pitt and picked up right where he left off in a win over Maryland Eastern Shore last week. Liberatore shut the Penguins down with 3 ⅓ scoreless innings before reliever Jextin Pugh replaced him in the top of the fourth. RBI singles by senior Ron Sherman and junior Jacob Wright helped the Panthers take a 5-0 lead into the fifth, but Youngstown State promptly responded. To say Pugh struggled with his control in the top of the fifth would be an understatement. The junior right-hander plunked two batters and threw three wild pitches before sophomore Isaac Mattson replaced him out of the bullpen for the Panthers. Mattson threw a wild pitch of his own, allowing a third run to score, but induced a groundout to end the inning. Pitt put five more runs up in the bottom of the fifth without recording an out, but a rainstorm forced the game to be called early. Though the five-run inning didn’t count, the game counted as an official 5-3 victory for the Panthers because it was at least halfway complete. Pitt hosts the rival Penn State Nittany Lions at Cost Field on Wednesday, May 11 at 6 p.m. Penn State shut the Panthers out in State College, 7-0, on April 5.